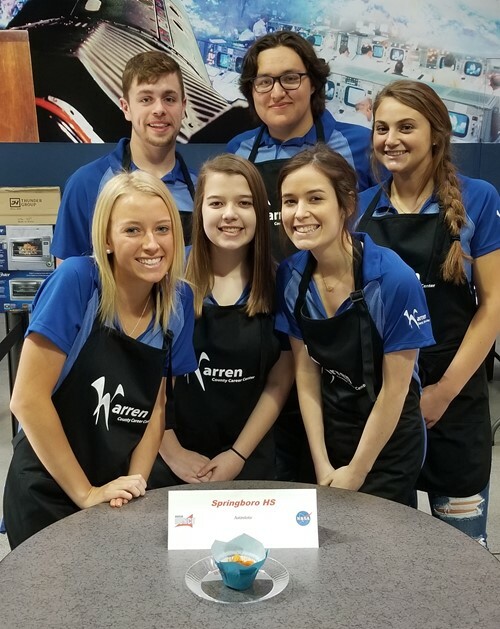 Springboro Family and Consumer Science students Michael Sander, Catherine Postner, Eric Maurer, Anna Lewis, Kaitlyn Bush and Jordan Scheper, satellite students through Warren County Career Center, have been selected as national finalists for the NASA Culinary HUNCH challenge in Houston, Texas, which was broadcast live on NASA TV! Students had to create a fruit or vegetable side dish that would adapt in a microgravity environment while adhering to specific nutritional guidelines. Their “Astrotots” recipe is a Cajun-infused roasted sweet potato and apple side dish. The students’ entry will be one of the choices for astronauts in the International Space Station to select as part of their meal rotation. The NASA HUNCH (High School Students United with NASA to Create Hardware) mission is to empower and inspire students through a Project-Based Learning program where high school students learn 21st Century skills and have the opportunity to launch their career through the participation in the design and fabrication of real world valued products for NASA. "I am proud of my students and how they are making an imprint on the future through their work with NASA,” Instructor Kim Harris said. “I have the utmost confidence that they will represent Springboro High School, Warren County Career Center and the state of Ohio exceptionally well." Satellite programming through Warren County Career Center offers STEM-focused educational opportunities through project-based learning environments to enhance students’ college, career and life visions. Warren County Career Center offers Satellite programming through our partner schools in Business, Digital Media Arts, Family and Consumer Sciences, Information Technology, PLTW Engineering, PLTW Biomedical, and Teacher Academy.